Former energy company executive Christine Hallquist made history Tuesday by becoming the first trans person to win a major party’s nomination for governor. BURLINGTON, Vt. — A former energy company executive from Vermont has come a step closer to becoming the nation's first transgender governor. Christine Hallquist swept to victory in Tuesday’s crowded gubernatorial primary, besting three other Democrats — including a 14-year-old boy — to become the party’s nominee. 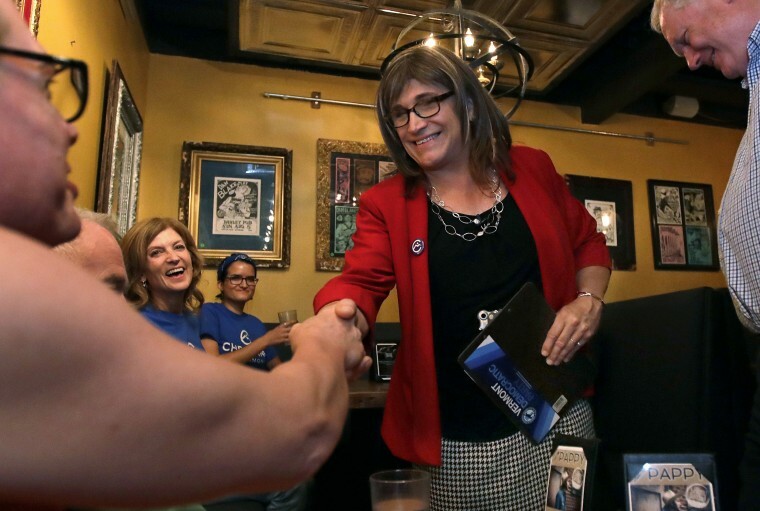 She is the first trans person to win a major party’s nomination for governor. "Tonight we made history, and I'm so honored to be ... part of this historical moment," Hallquist said to a room full of clapping fans at her election-night party in Burlington. "I'm so proud to be the face of the Democrats tonight." Hallquist will face Republican incumbent Phil Scott in November. Scott’s popularity has waned in recent months, but he managed to beat his Republican primary challenger by a healthy margin on Tuesday. The most specific parts of Hallquist’s platform follow a now-familiar progressive model: a $15 minimum wage, Medicare for all and free higher education. She is also campaigning on an aggressive expansion of renewable electricity and high-speed broadband access across the state. Hallquist said the anti-transgender policies of the Trump administration, including the attempt to ban trans people from serving in the military and the reversal of Obama-era protections for trans people in gender-segregated facilities, were factors in her decision to run for office. Hallquist’s past career as CEO of the Vermont Electric Cooperative gave her a major boost going into Tuesday’s contest. She’s credited with turning the electric utility around, and a poll found she had the highest name recognition of all the Democratic hopefuls in the gubernatorial race. “We are a very loving state, so when people are focusing on division, people don’t like it,” Hallquist said. Hallquist said she’s confident she has a good chance against Scott in November. That story of rural electrification and the way it transformed Vermont in the 1930s is a major theme of Hallquist’s campaign, and it featured prominently in her advertisements. The modern-day version of stringing electric lines is stringing fiber-optic internet cables, and Hallquist, who formerly led the Vermont Electricity Cooperative, knows a thing or two about infrastructure. Dustin Tanner, a Democratic nominee for the Vermont state Senate who ran uncontested on Tuesday, said he voted for Hallquist. A self-described “Bernie-wing” Democrat, Tanner said there are parts of Hallquist’s platform that are “a little conservative” for him. However, he said her plan for rural broadband connectivity was a main reason why he voted for her in Tuesday’s primary. Tanner, whose day job is in the information technology department of a local school, said he’s keenly aware of how crucial it is for Vermonters to have fast internet.